When I was 20 years old, I got engaged to the boy I had been dating since I was a senior in high school. He was the first boy I ever dated. The first boy I ever kissed. He was four years older than me so as I was entering my freshman year of college he was completing his senior year of college. We dated faithfully all through my college years with visits every weekend and nightly phone calls. We were set to be married the October after I graduated college in 2001. I was beyond excited to plan the wedding and start the adventure that would be the rest of our lives. I graduated in May and immediately started a full time job. This new job brought a whole new world with it. I worked in the city with a young crowd of people. We talked a lot. We went out a lot. We drank a lot. I was suddenly leaving a small(ish) town behind, taking the train to the city, and surrounded by people who were all different from me. It was exciting and eye opening. I started seeing a whole new world that stood in front of me. A world that I knew I would never fully explore if I got married in a couple of months. I pushed these hesitations and “cold feet” feelings off to the side and never told anyone from my “old” life about it. My new friends thought I was crazy for planning a wedding. I started to feel like I was living a double life. October got closer and closer. In September my fiancé and I were planning on moving into a new apartment together. I started dragging my feet by saying that he could move in to the apartment and I would move in after the wedding. I sold it as it being a nice tradition of not living together before marriage but inside I was terrified of moving in with him. I knew deep down that it wasn’t what I wanted. The problem was that my fiancé was great. I could never say a bad word about him. He was Mr. Right. He didn’t do anything to make me change my feelings about the wedding. It was simply that I had graduated, grown up, and realized there was a whole world out there that I hadn’t explored yet. I told myself that this was the life that I had chosen. How could I ever cancel the wedding? 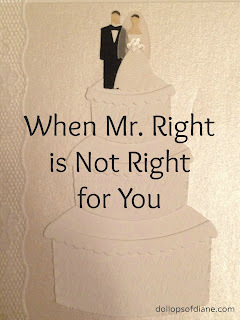 Getting engaged was a decision that I had made and I had to follow through on it. I couldn’t shake the feelings though. I can remember driving one day and thinking that if I had an accident and hit a tree that maybe we would need to post pone the wedding. I was NOT thinking of killing myself. After all, I had just discovered a new life that I wanted to live. But I was thinking that if I was injured (a broken leg, a minor hospital stay) that it would give me a reason to postpone – a reason that no one would question, a reason that wouldn’t hurt anyone’s feelings. It was at that point that I knew that I had to come clean to my fiancé. It was by far one of the most difficult and emotional nights of my life. It was horrible but necessary. We ended up cancelling the wedding five weeks before the day we were set to be married. Invitations had been mailed the week before. Keeping my feelings bottled up made my decision a complete shock to everyone. I do wish that my change of heart and my path of discovery didn’t have to hurt people along the way. However, I know that my former “Mr. Right” would not have had the life that he deserved if he was married to someone who was not in it 100%. I look back on that decision and the months following as some of the most challenging of my life. I know now that it was a path that I had to go down to get me to where I am today. I have never doubted that I made the right decision and that I am living the life that I was destined to live. It turns out that sometimes Mr. 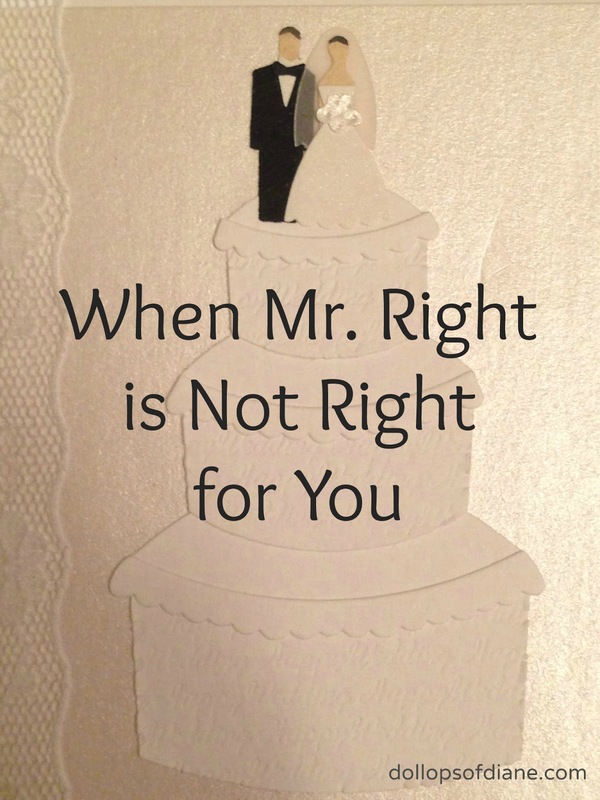 Right is just not right for you.